Two of these bad boys were waiting on the kitchen counter for me last night when I came home from work. Smooth dissolve formula. Berry flavor. Flowers, schmowers. Chip knows the way to a pregnant woman's heart. Keep her well stocked in the Tums of her choice. Two tums - that is laughable. Try maybe 2 nexiums with minimal relief and then we can talk. 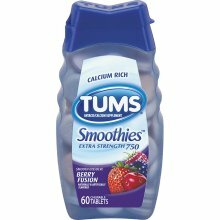 I do agree the Smooth Dissolve was a big step forward for the Tums brand. You acid reflux sufferers are a bitter bunch.